The black walnut (Juglans nigra) is one of the most sought-after native hardwoods. It is prized for its fine straight grained wood and tangy nutmeats. Iowa is 6th in the nation in production of walnut lumber, while Missouri is first in the nation in both production of walnut lumber and nutmeats. 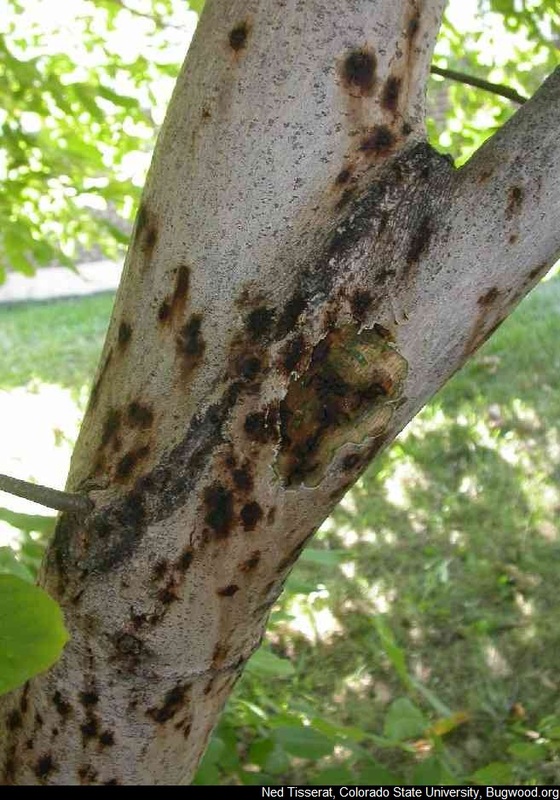 Thousand cankers disease (TCD) threatens the entire United States walnut industry, and is caused by a recently described fungus, Geosmithia morbida , that is vectored by the walnut twig beetle, Pityophthorus juglandis. TCD has not been found in Iowa to date. 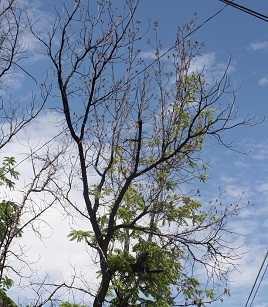 The disease occurs in nine western states, and was found for the first time in the native range of black walnut in Tennessee during July 2010. The disease has also been found since then in isolated locations of Virginia, Pennsylvania, Ohio, and North Carolina. 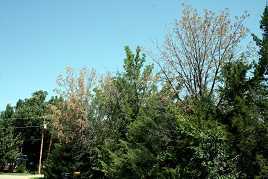 What is Thousand Cankers Disease? TCD is a recently recognized disease of walnut. 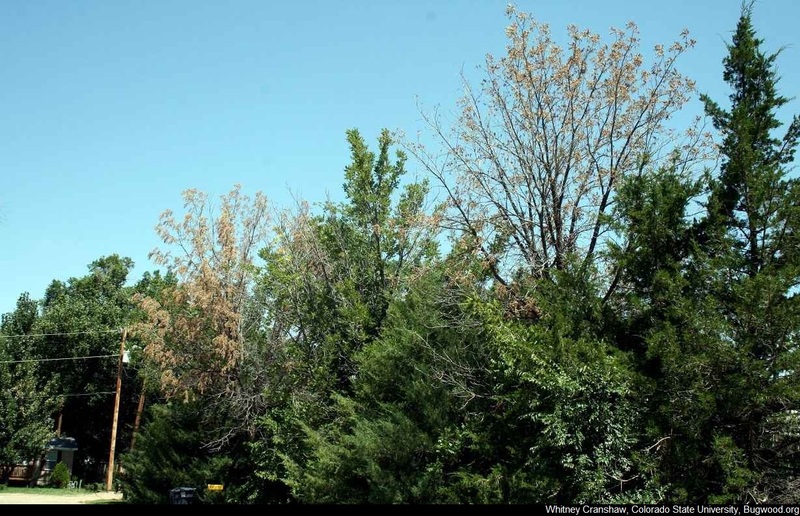 Death or decline of walnut trees have been noticed for a decade in several western states (California, Oregon, Washington, Idaho, Utah, New Mexico, Colorado and Arizona). 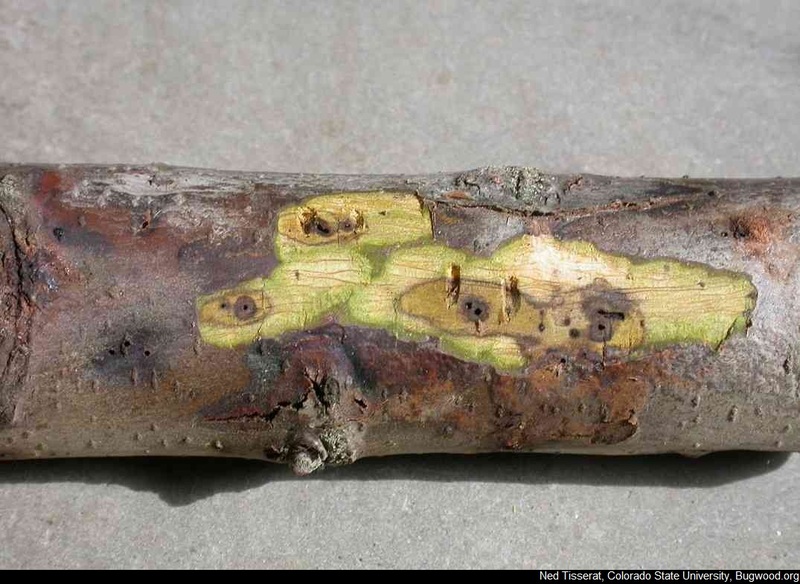 It wasn’t until 2008 when the fungus was first identified in Colorado, and it was also determined that the walnut twig beetle was vectoring the fungus. 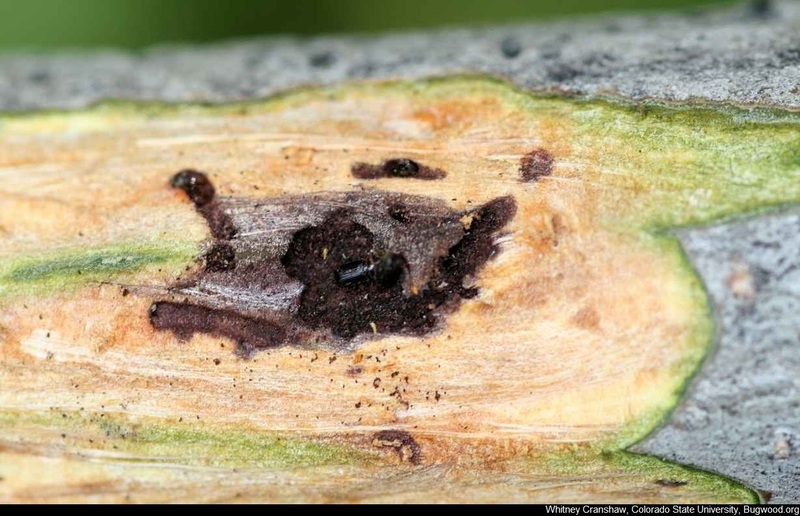 The walnut twig beetles carry Geosmithia fungal spores to uninfected trees. As the beetle feeds on the tree and constructs galleries under the bark, the fungus infects the surrounding tissue near the beetle's gallery. The fungus kills the phloem tissue causing a small darkened area of dead tissue around the beetle gallery. This small area is called a canker. The cankers caused by the Geosmithia fungus are small, but multiple attacks by walnut twig beetles may result in many cankers on the same tree. 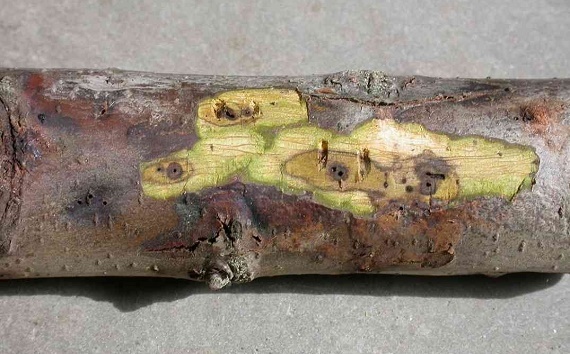 These cankers collectively girdle and kill branches, and can kill the entire tree. Essentially the tree is killed by thousands and thousands of cankers. This is very different from Dutch elm disease or oak wilt. These insect vectored diseases only require one introduction of the pathogen, where the fungus spreads through the whole tree, and will even spread to neighboring trees through roots that have grafted together. 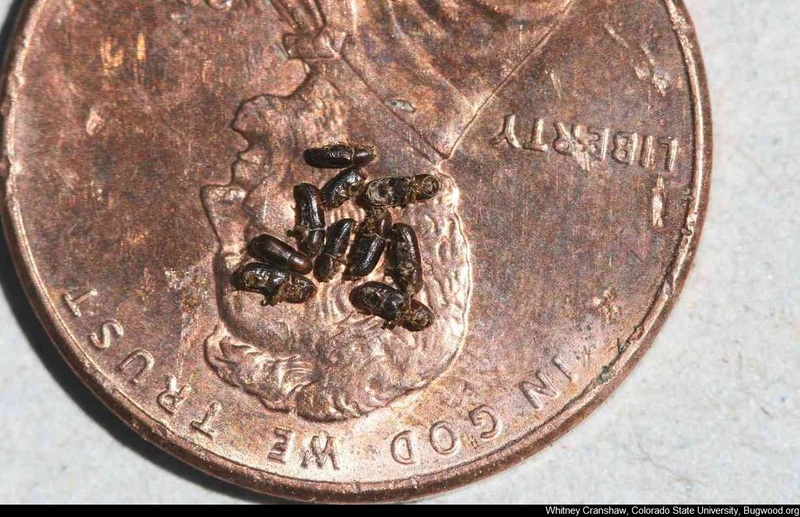 The walnut twig beetle is native to the southwestern United States, and was first noted on Arizona walnut (Juglans major), but it is not considered to be harmful to this walnut species. The walnut twig beetle appears to have made the jump, from Arizona walnut to black walnut, that was planted by eastern settlers as they relocated west. Walnut species are known to vary in susceptibility to thousand cankers disease. Eastern black walnut is very susceptible. It is unknown if the Geosmithia fungus is also native; however, the beetle and the fungus together have greatly expanded their range in the western United States as warmer weather continues to prevail. 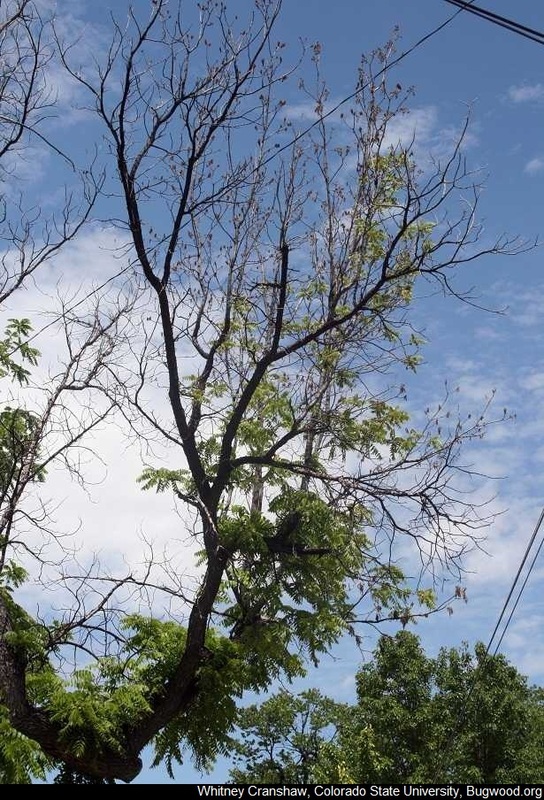 A black walnut tree can be infected with thousand cankers disease for many years before showing symptoms, but once branch dieback appears, the tree rapidly declines and dies within a few years. 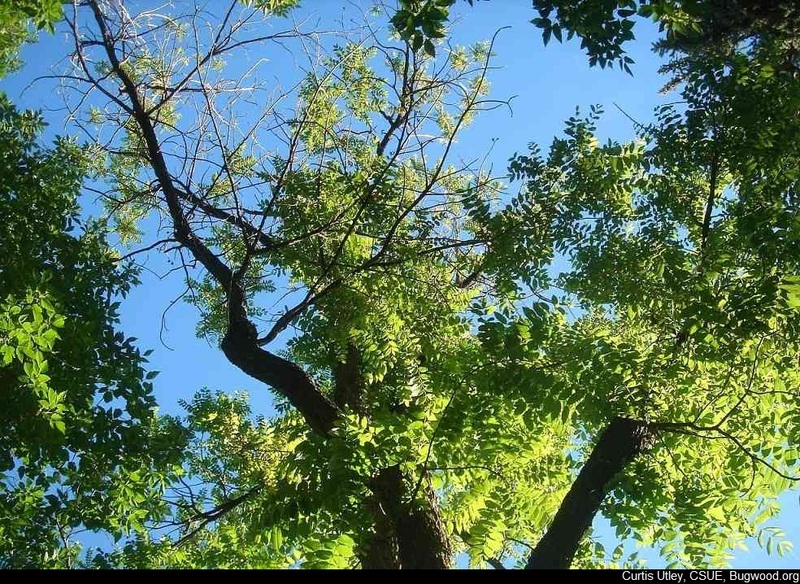 What are the symptoms of TCD on black walnut? The first symptoms to appear are flagging leaves (leaves wilting and yellowing mid-summer). This is followed by thinning of the canopy from twig and branch dieback. Eventually the whole tree dies, as thousands of cankers girdle branches and the trunk. 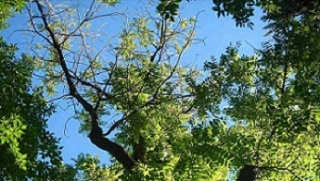 The symptoms of TCD on black walnut are similar to decline and death from other causes, particularly environmental stresses, so it is important to evaluate the whole tree. See below under ‘how you can help’ for information on what to do if you have a walnut tree showing symptoms of TCD. Natural spread from the beetle flying to new trees occurs mostly on a small scale, as the beetle cannot fly very long distances. 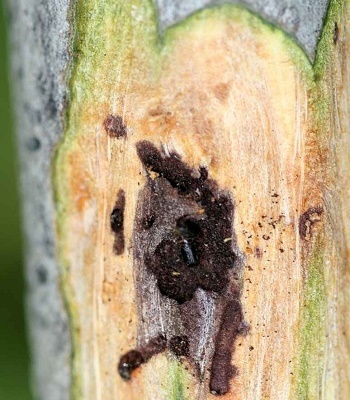 Similar to other tree pests, long distance movement of thousand cankers disease is primarily by people transporting walnut wood and logs, firewood, wood packaging material, nursery stock, and scion wood. Nuts are not a concern, since TCD does not move systemically through the tree and is not seed-borne. What lessons were learned from Tennessee? Branches of mature walnut trees are hard to sample with pole pruners, often a bucket truck or tree climbers are needed. Live wood is better than dead branches for sampling. The walnut twig beetle is often found on the west, or sunny, side of the tree and on the lower portion near leaf scars. 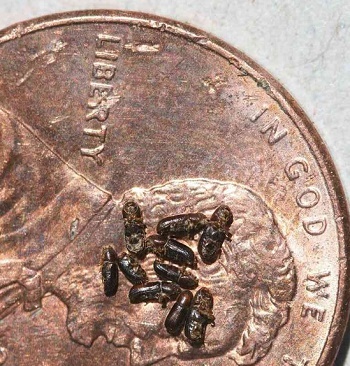 The fungus has always been found with beetles in the western states, but this does not hold true in Tennessee. There is more than one Pityophthorus beetle that can be found in walnut bark. If you have a walnut tree with branch die back and are concerned about the possibility of TCD, we ask that you first contact the ISU Plant and Insect Diagnostic Clinic from the Contact us page to let us know that you have TCD suspect sample. Before mailing anything we ask that you freeze the sample for 48 hrs and double bag the sample to kill any beetles. If live beetles emerge from the sample in transit it would spread TCD even more.